The "famouse" reporter appears on a TV game show to save his newspaper and joins his sister on a haunted pirate treasure hunt in this pair of exciting adventures. Mouse tales: don't miss any of Geronimo Stilton's adventures. 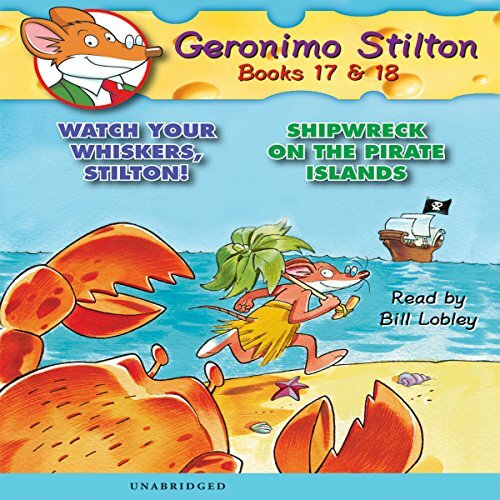 My daughter loves Geronimo Stilton, and my husband and I enjoy them too. There's a lot of humor in the writing and in the performance. My son 'n I have listened to all the other Stilton adventures up to this one. I found this one to be a little different than the others in that the story seemed to lag. To me there seemed to be a bit of pushing to find an actual story line. But, as I said, that's my opinion. You might actually enjoy the interjection of the new character this one has.